Welcome to this month’s Blogorail Red Loop. Today we are sharing some of the magic you can expect at the 2017 Epcot Flower & Garden Festival. Over at Epcot at Walt Disney World, each year the creative geniuses turn out two major events that are a highlight for those that attend. In the Fall is the Epcot International Food & Wine Festival, and in the Spring is the Epcot International Flower & Garden Festival. Today marks the start of the 2017 edition of the Flower & Garden Festival, and the festival runs until May 29th. If you are lucky or fortunate enough to be able to visit and enjoy the festival, that’s great, but the good thing is that many of the topiaries will be around Epcot even after the festival has concluded. The picture at the top of this post was taken in June 2011, some weeks after that festival ended. I’ve not actually been to Epcot during a Flower & Garden festival before, it’s one of those things that I’m looking forward to enjoying one year, but so far we haven’t been able to do so because of school schedules. So at this point I’ve got pictures that were shared with me from my friend Alicia, and my imagination will take me the rest of the way. Pooh is looking for honey! I really love the topiaries, and look forward to seeing them one year. What I’m most looking forward too, though, is being able to take my wife Cindy to Epcot on her birthday and experiencing it first hand. Tomorrow is her birthday, so we would be right in line with seeing the start of the festival. Here’s how I picture it in my mind’s eye. It’s an absolutely incredible spring-like day. The sky is a brilliant blue, with a few wispy clouds dotting the landscape. Cindy and I are staying at Disney’s Beach Club Resort, a resort that we’ve visited before but have never stayed at. For Epcot, it’s a great resort because you can just walk to the park, enter through the International Gateway, and take in the festival. In fact, on this day, that’s just what we did. We visited all of the pavilions that we enjoy, Canada, China, the American Adventure, Norway, Italy, Germany, France, Mexico. In fact, we visited them all because today was a special day, a day when it was just Cindy and I, walking hand-in-hand, enjoying being at Walt Disney World, and sharing our love for each other with those we encounter. Everyone has a smile on their face, because when you are at Disney, that’s what you do most of all — you smile. You take everything in, and you don’t worry about anything because at Walt Disney World, everyone turns into a version of their childhood once again. After we walk around the festival, we ride some of our favorite rides: Soarin’, Test Track, Spaceship Earth, and we remember fondly those attractions that aren’t around anymore, like Maelstrom. The reality for me is this. Visiting Walt Disney World and Epcot during the Flower & Garden Festival would be great because it would mean that I am able to visit Disney with my wife once again, something we haven’t been able to do for a while now. It would mean that things are much better than they were, and when we go to Walt Disney World next, it will truly feel like this is the first time we have been. 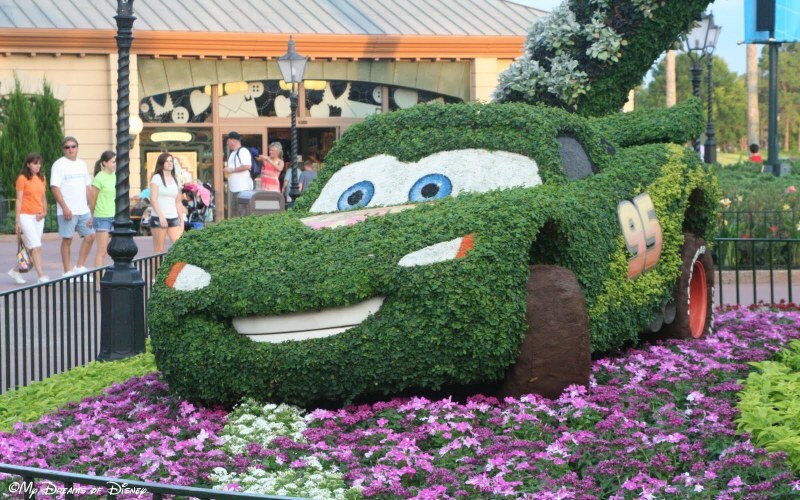 What are your thoughts about the Epcot International Flower & Garden Festival? Please share them with us, and make sure you check out the rest of the posts from this loop. Thanks for stopping by! Middle of Winter? Let’s think about the Flower and Garden Festival! Happy Halloween at the Magic Kingdom! Let’s Get to know Alicia, our new My Dreams of Disney contributor! I hope you get the chance to go for it one year. It’s one of my favorite times to visit, Epcot is so stunning! Thanks Becky, it’s definitely on my list to do! Karen and I went one year and really enjoyed it. Friends of ours who went recently said the crowds were crazy, that there seems to be no off season or slow day now.Still, it’s worth a one time visit for sure! The crowds never bother me because most of our trips are during the busy summer season anyway. I know how to navigate them and I look at the more laid back things. Thanks! I hope you get to visit during the festival soon! I think you will love it. I’m sure that I will Melissa! Thanks!